Have you ever seen two friends or family members reunite? The emotional greeting usually involves hugs with happy, loud voices, pats on the back, and arms around one another. In some cases, there’s even a spank on the bottom or noogie to the head. Now, compare that type of greeting to a first time meet and new individual, whether at a party or office environment. In this situation, voices are controlled and body parts aren’t flying haphazardly everywhere (or at least they shouldn’t be). Composure, control, and structure frame greetings in more formal environments or amongst people unfamiliar with one another. Looking at dog to dog interactions and behavior, the same rules hold true. The relationship a dog has with the other dog(s) he is greeting or playing with map the type of behavior a dog should or will offer. During greetings, formalities are expected and appreciated. As mentioned in previous articles, a nice dog greeting is arc-like. The dogs go in at each other’s side and sniff one another’s tushies (I get to use that word a lot. How lucky am I?). This is polite dog-greeting behavior. It may look a little bit stiff or broken up as they first meet and are sniffing each other out. They are — and gauging the other’s intentions and offering a lot of body language to help put one another at ease. There’s usually very brief pauses and interruptions. Then one of the dogs might offer a “Let’s get this party started” play gesture and the zoomies commence. Other times, after the formal tushie sniff, they are uninterested in play. They have sniffed each other out and go about their ways, maybe offer a shake-off as they walk apart. 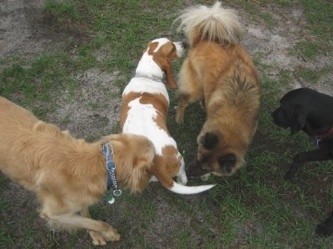 Now, once dogs have gotten to know each other, the rules loosen up. It’s just like us. Once they know the general temperament and what they can expect from the other, and have a solid understanding for another’s overall intentions, the play and interactions become less guarded. They become more tolerant of one another and forgive each other for occasional slip-ups. For dogs who know each other, you might see immediate wrestling type body contact. They might run blazing at one another before jetting off on a big run together. It’s like the greeting I mentioned from our reunited friends and family above. They drop some formalities based on their history and friendship. This video (is long) but a GREAT example of a budding relationship. Enjoy the awesome faux electronic keyboard Madonna …And I FEEL!! Generally, just watch as the relationship blossoms. A formal greeting, then an escalation and rules are set: “NO MORE MOUNTING AND NECK OVERS!” It’s a good example of why play shouldn’t always be left up to just the two dogs. I would redirect these two as they are working to come to an understanding. At the very early stages, notice all the choppy breaks in the greeting, the dogs almost appear “distracted,” offering a lot of head turns and averted gazes. This is part of the dance. The merle (grey/black) offers an immediate play bow. He missteps though by putting his paws on the fawn’s (lighter red) back and mounts too. The fawn quickly corrects him, the play pauses and they both offer head turns before commencing play. In this play session, the merle is generally more assertive and pushy. Notice he does a lot of putting his neck over the back of the fawn, paws on the back, etc. The fawn is tolerant to begin. Throughout this video, the fawn works overtime. He is overwhelmed by the pushy merle at points and works hard to keep himself, and the merle calm and polite! Notice how the play goes vertical or tends to leave the ground. This is intense behavior. When interactions turn to this, the dogs should be interrupted. Not by grabbing a collar, but by calling apart and engaging in other activities. The play gets a bit amped up, a lot of mounting and a tumble, and then you see a shake off (2:30). As the play progresses (about 2:50 mins in), the fawn has had enough of the mounting, paws on the back and neck over his back. He will remove himself from the play (he literally just walks away). He teaches the merle, “You want to play like that, find another!” He works actively to control the merle’s play by doing this. Each time the merle starts the neck and paw business, the fawn briefly ends the play. You see as this progresses, more fluid periods of play and full body contact develops. They are working through this. They are generally interested in interacting, but are both working to develop an understanding (the fawn looking to take it down several notches and removing himself!. Who doesn’t love watch loose-limbed Danes flop all over? Enjoy!